Fall is here! With days officially dropping to jacket-weather temperatures, it is time to remember all of the items needed to make your home ready for winter. 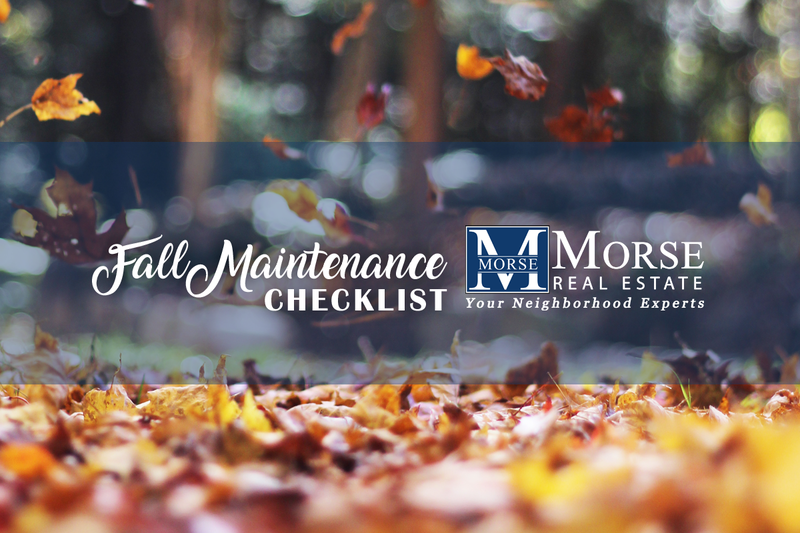 Let’s make it easy and get ahead of Jack Frost with this fall home maintenance checklist. • Winterize your grill by giving it one final, deep clean and covering burners and other metal parts with cooking oil to prevent rust. Also, shut off your gas and put a protective cover over the whole unit. • Seal up exterior cracks and gaps in siding, windows or foundation with caulking or weather stripping. • Take advantage of the low humidity weather and paint your home or stain and seal your deck. • Clean your gutters and make sure they are secure. • Bring any glue, liquid weed killer, paints, stains, finishes and spray cans inside so they do not freeze. • Store outdoor decorations and furniture or at least cover it up to extend the life. • Hook up seasonal batteries for boats or small vehicles to a battery maintainer. • Fix any cracks in the driveway to keep moisture from getting in to freeze, expand and make them bigger. • Aerate, fertilize and reseed your yard. • Have your sprinkler system drained and blown out. • Winterize your lawn mower by removing all fuel or filling up the tank and adding fuel conditioner and running it for a couple minutes so it can circulate. • Empty your flower pots and planters. Bring any clay or ceramic containers inside. • Drain all garden hoses and sprinklers and store. Also turn off water to all exterior hose bibs and drain pipes. • Trim back trees and bushes and remove dead branches from to keep them from falling once weighted with heavy snow. • Rake your leaves and shred them for compost, mulch or on top of flower beds as a winter blanket for your garden. • Divide or move perennials and remove any dead annuals. • Mulch perennials after the first hard freeze and do not cover the center point (crown) to avoid rotting. • Clean garden tools before storing. • If you have been feeding birds from your yard, be sure to stock up on bird food to continue feeding them this winter. • Mark the perimeter of your driveway and sidewalk by pounding in driveway markers for easier snow removal. • Get your snowblower ready for service. • Make sure you have a snow shovel that is in good shape. • Grab a bag of pet and plant safe ice melt from the store. • Change the direction your ceiling fans spin so they can circulate the warm air down toward the floor. • Wrap any water pipes that run along exterior walls with heating tape or insulation to save energy and prevent freezing. • Replace the furnace filter or consider having your HVAC system maintained by a professional. • Remove any window AC units or cover the entire exterior to keep cold air out. • Clean out your dryer vents and remove lint. • Check attic insulation is at the proper level and doesn’t cover vents in the eaves to prevent winter ice dams on the roof. • Check bird and rodent screens for attic vents to prevent any unwanted guests. • Schedule a chimney cleaning. • Have your home tested for radon since windows are shut more in the fall and winter. • Change the batteries in your carbon monoxide alarms and smoke detectors. • Check the expiration date on your fire extinguisher and replace if needed. Before allowing anyone into your home, you should have it thoroughly cleaned. This means dusting, vacuuming and taking out the trash. It may also mean taking steps to remove smoke or other odors from the air. If walls or other surfaces have mold on them, be sure to clean them prior to an open house. In addition to increasing the odds that someone makes an offer, taking the time to eliminate mold will go a long way toward reducing the risk of potential buyers getting sick. Prospective buyers want to get an idea as to how a given space within a home can be used. For instance, they may want to see if there's enough room for their bed in the master bedroom or if there's enough room for the couch in the living room. If you have a finished attic or basement, be sure to showcase it as a space a buyer can make good use of. When you show a house, you want to present a neutral look to potential buyers. This may mean getting rid of posters that make political or religious references. You may also want to hide items with sports logos, especially if you live in an area where rivalries are huge. By doing so, you will allow those who visit your home to imagine themselves living in the space without having anything to cloud their vision. If you're planning on making repairs prior to selling the home, do them before allowing anyone to see the space. For instance, you may want to repair the leaking water heater or replace shingles that have fallen off the roof as soon as possible. You should also make sure the garage door opens and closes properly and that all of the lights work. If you want to sell your home in a timely manner, you must know how to prepare the space for public viewing. Making repairs, removing offensive items and properly staging the property may all increase the odds of selling your home. By taking these steps before a showing, you may very well increase a buyer’s confidence that the home is worth putting an offer on. This holiday season, over 100 REALTOR® associations will be supporting the Salvation Army on Friday, December 1. This idea came from a REALTOR® member in Fargo, N.D., who wanted to give real estate professionals an opportunity to support a cause familiar to them - housing. The Salvation Army was the perfect fit because it offers so many housing-related programs. This is the Iowa Association of Realtor’s sixth year participating in this great event joining over 26 other states ringing the bell for the Salvation Army. Last year, more than 300 Iowa REALTORS® representing all 17 local boards participated in this event and raised more than $30,000. A few members of our team came out to volunteer. We had a lot of fun joking, singing and ringing! The National Association of Realtors just released a report covering the latest data on our national housing market. Many of the figures were staggering and surprising. The following charts summarize the biggest findings from the report. 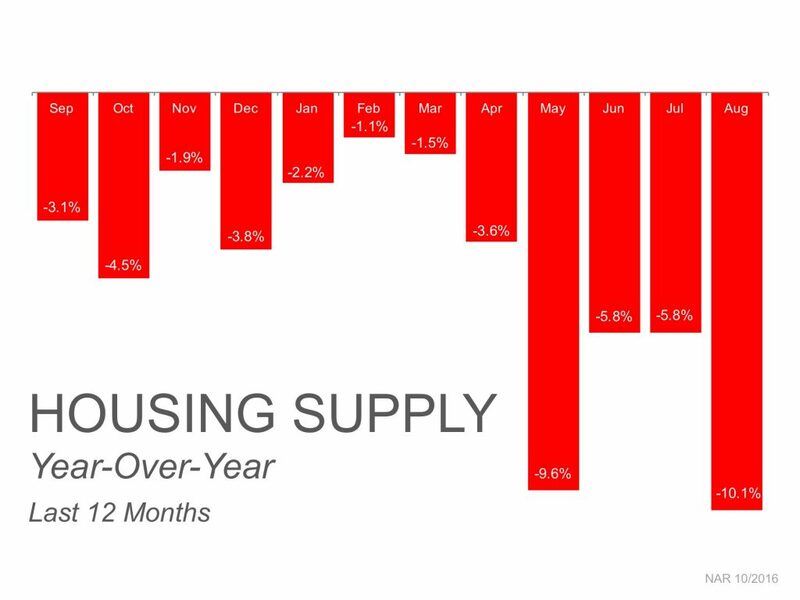 Housing Supply Year-Over-Year: Last 12 Months: One of the more surprising data produced from National Association of Realtors was the giant leap in housing shortage from July to August. It showed that nationally we are experiencing an incredible 10% decrease in homes on the market. 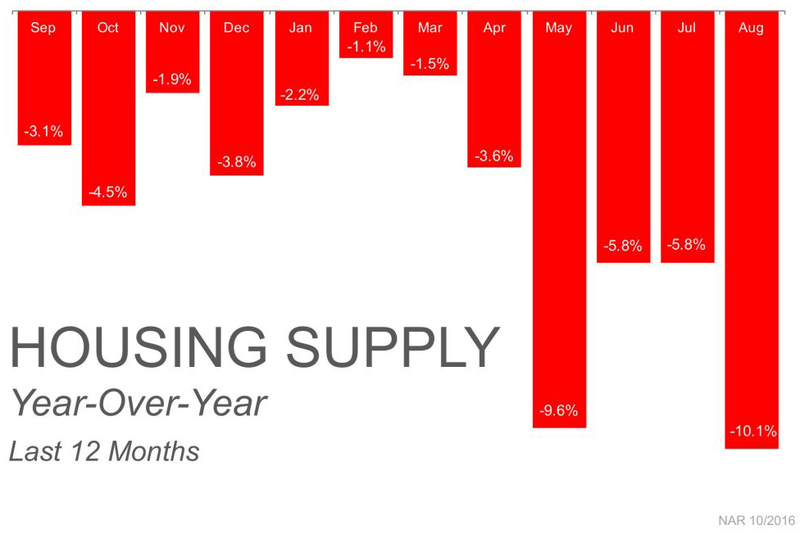 It could be reasoned that a lot of buyers scooped up a ton of inventory during the summer leaving August high and dry. This could also mean buyers are struggling to find their next dream home. 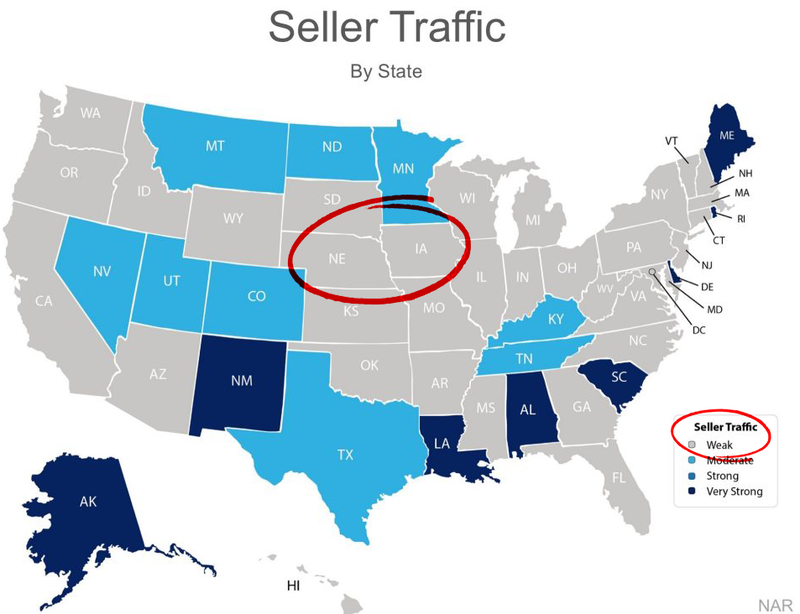 Seller Traffic By State: To breakdown the data and apply it to each state we can see just how many homes are listed for sale by state. Alaska, New Mexico, Maine and four other states are experiencing Very Strong seller traffic numbers which means there are more homes to choose from. However, Iowa and Nebraska and most of the nation do not share the same fate. Seller traffic is weak meaning that these housing markets are struggling and need more homes listed for sale. 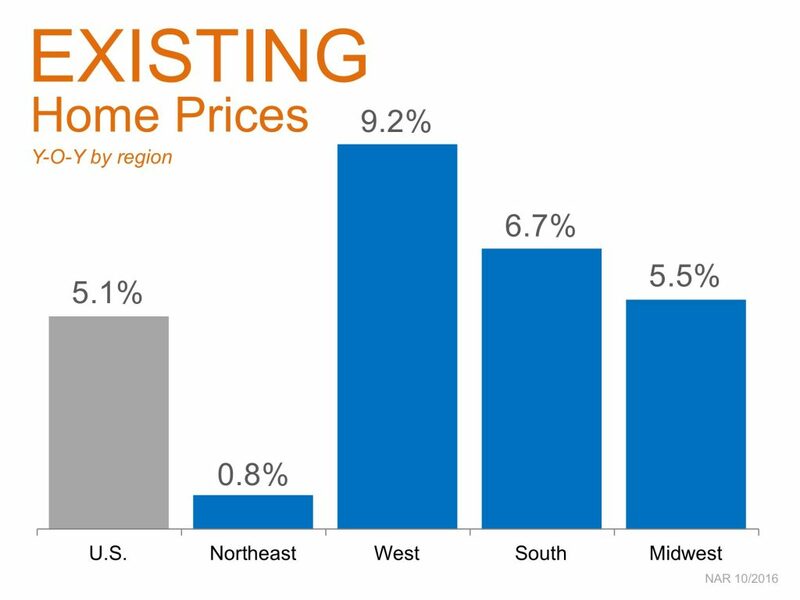 Existing Home Prices Year-Over-Year by Region: Nationally sellers are receiving 5.1% more for their homes this year versus last year. However, sellers in the Midwest are receiving 5.5% more on average. By the way, homes are selling for more and much faster as opposed to last year, with many having multiple offers in less than 48 hours. 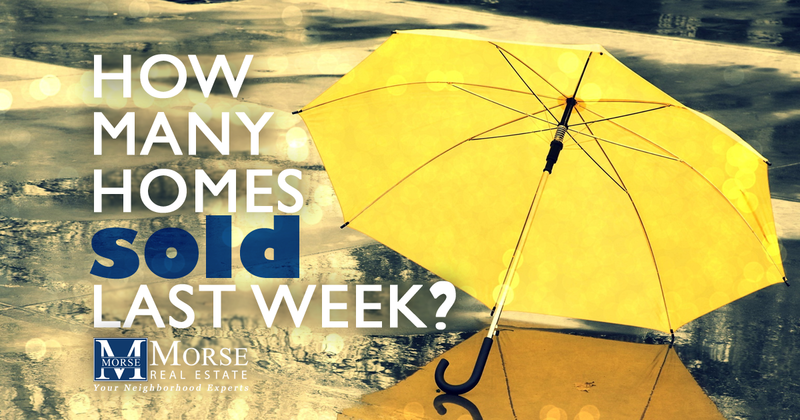 How Many Homes Sold Last Week? Kids are back in school but it hasn’t slowed the housing market down. Just over the last weekend, our brokerage had a listing that received over 20 written offers on it! 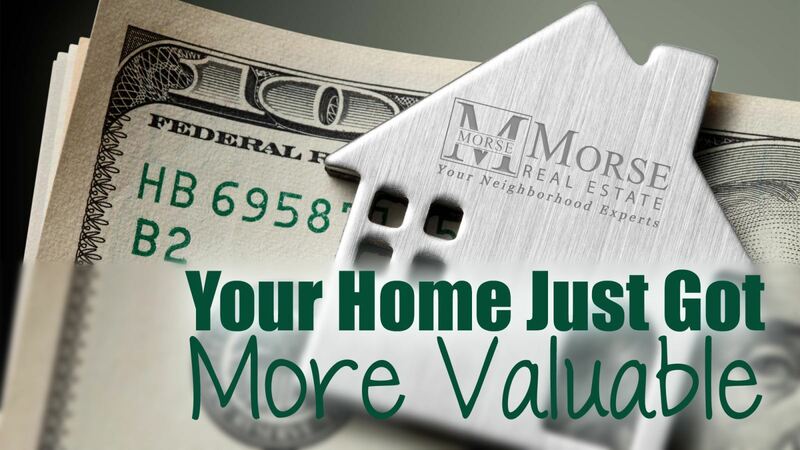 To find out more about what your home is worth, contact one of our experienced agents today! With a knowledgeable agent, attention to detail and the right market, homes can be listed for sale and purchased within a few hours. 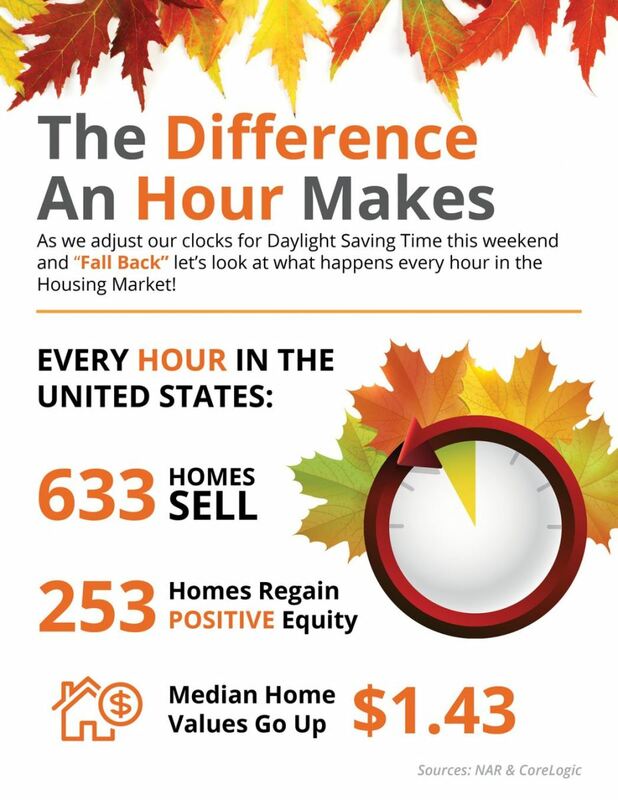 Today's market is full of fast sales and happy buyers and sellers. See the 4 listings below that have sold in less than 2 weeks! This home was listed by Mike Morse after it had been on the market for 122 days with another agency. 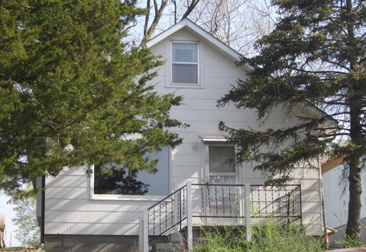 It is a 4 bedroom, 1 bathroom home with 1,561 finished square feet. In less than 24 hours with Mike, it was sold! This beautiful ranch is seated right on the water and boasts 2,971 finished square feet with 4 bedrooms and 3 bathrooms. 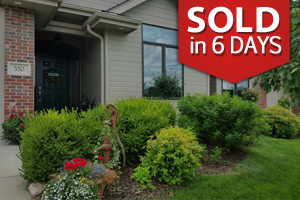 Abby Tietsort got this incredible home listed and sold in only 6 short days! Located in a desirable, east-end neighborhood, this split-level is beautiful on the inside with 4 bedrooms and 1.75 bathrooms and a large, fenced backyard. 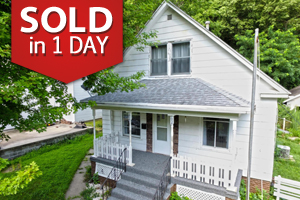 Christy Rhoades found a buyer for this home before it was even listed for sale! 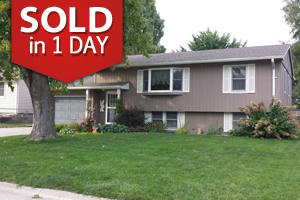 This bank-owned townhouse in Omaha had multiple offers and was listed by Mike Morse and sold within 10 days! It features 1,807 finished square feet and has 2 bedrooms and 2 bathrooms. 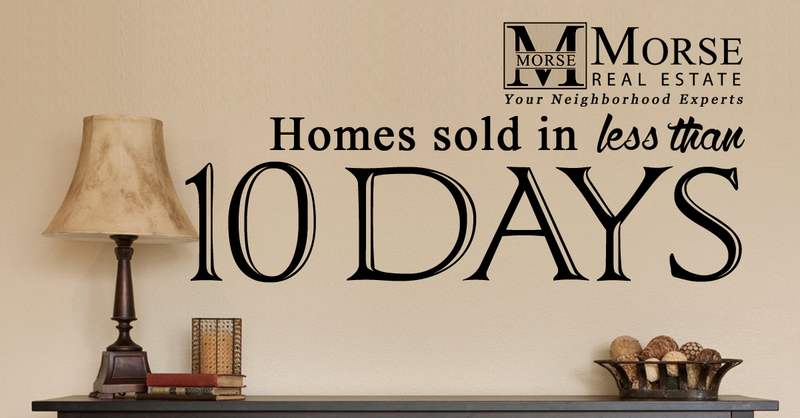 Speak to one of our agents today to find out how to prepare your home for a fast sale! The month of July is officially behind us and August has begun. 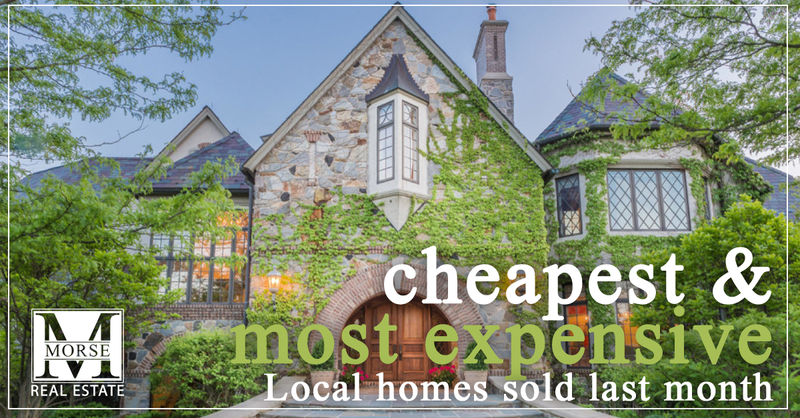 That means it is time to look at the cheapest and most expensive homes sold last month. 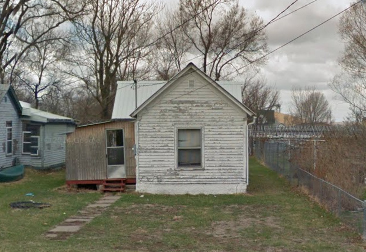 For a whopping $12,500, this 1.5 story home in Omaha was on a 137 x 100 lot with 2 bedrooms and 1 bathroom. This tiny home had just under 840 square feet including a full basement. It was on the market for just 2 days before being paid for in cash. Located in the Fairacres subdivision on 1.36 acres, this 2.5 story brick home offered 6 bedrooms and 6 bathrooms with full basement for $1,552,000. 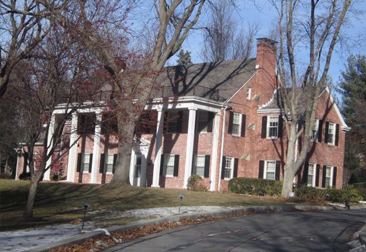 It featured over 6,200 square feet and annual taxes of $28,132. Remarkably, it was only on the market for 1 day selling to a conventional buyer with 20% down. A buyer finally snagged this home in Shenandoah after it was on the market for 328 days. They paid $7,500 cash for 968 total square feet featuring 2 bedrooms and 1 bathroom on the main floor. The most expensive home sold in southwest Iowa was purchased in Council Bluffs last month for $795,000 after only 6 days on the market. 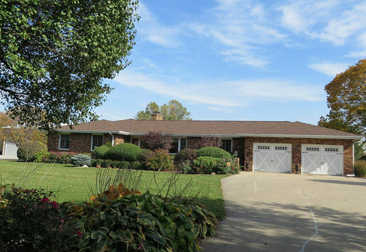 The brick, ranch-style home with over 5,300 square feet had a private drive, outdoor kitchen, in-ground swimming pool with 5 bedrooms and 4 bathrooms all on 4.5 acres. 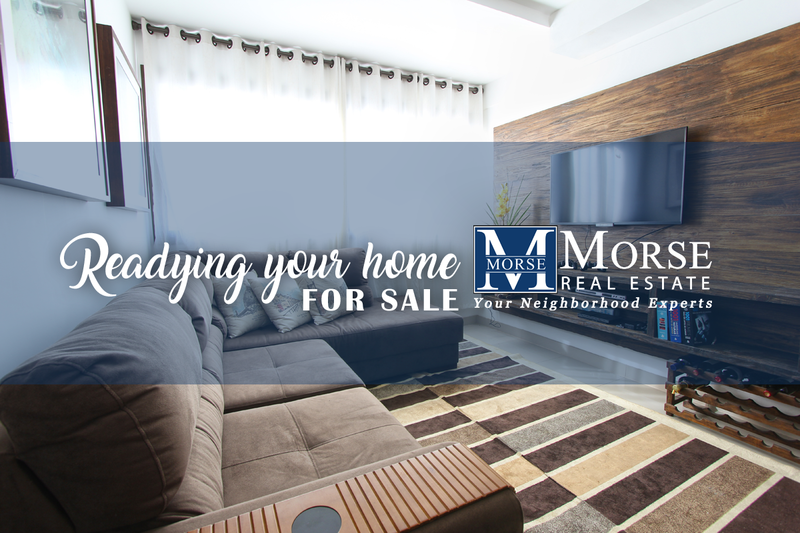 Want to know more about the homes selling around you? Click to find an agent. 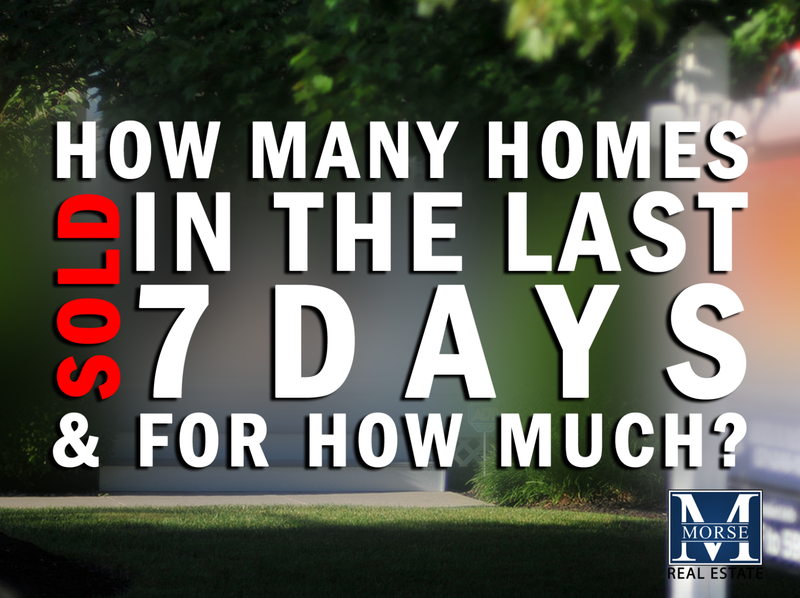 How Many Homes Sold in the Last 7 Days? 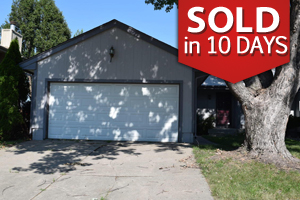 Since July 29th, the market has picked up substantially in both Omaha and Council Bluffs areas. Prices are going to continue to climb, act now before you are priced out of your future home. If you are on the fence about listing your home for sale and debating whether now is the time to move on with your plans of relocating… don't wait! There are more buyers that are ready, willing and able to buy their first, second, third, or investment property now than there has been in years! The supply of homes for sale is not keeping up with the demand of these buyers. Listing your home for sale now will give you the most exposure to buyers and the best sales price. It is time for the sound of water roaring through the broad opening of a nearby hydrant and screams of delight as the cool water splashes everyone on the hottest days of the year! Visit with the neighbors, watch the kids and enjoy the fun. 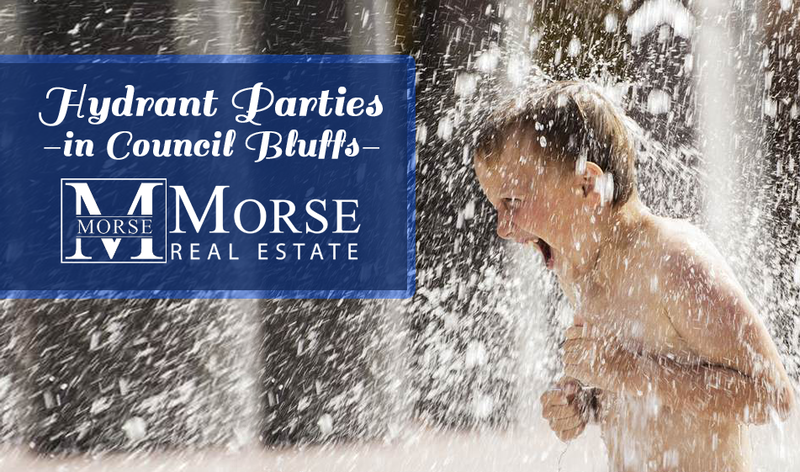 Click to download the neighborhood hydrant party schedule for Council Bluffs.